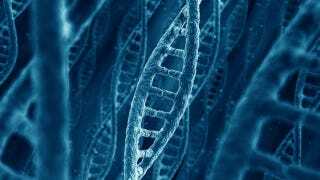 What mysterious genetic material ruled the world before DNA and RNA? All living organisms use DNA as the carrier of genetic material and RNA as the messenger molecule directing the expression of genes and creation of proteins. This arrangement has lasted 3.5 billion years. But what came before these life-giving molecules? These two massive molecules are wonderfully versatile, capable of assembling and replicating themselves while also folding into all the different shapes needed for proper biological functions. Both DNA and RNA work by stringing together lots of different combinations of molecules called nucleotides, and it's the arrangement of these nucleotides that provides all the larger scale genetic information. Both DNA and RNA are held together by "backbones" that are made of phosphates and sugar. These chemical bonds provide the structure needed to hold together the long chain of nucleotides in a single giant DNA or RNA molecule. In fact, it's these backbones that give the two forms of genetic material their name - the sugar holding together DNA is deoxyribose, hence deoxyribonucleic acid, while RNA contains ribose. It's these sugars that have led researchers at Arizona State to consider the possibility of a simpler genetic material that ruled the primordial world more than 3.5 billion years ago. Both ribose and deoxyribose are what's known as five-carbon, or pentose, sugars. This simply means that their chemical structure features five carbon atoms. The problem with pentose sugars is that they don't emerge and combine easily, especially in an ancient Earth that had not yet been transformed by the presence of RNA and DNA. That's a bit of a biological Catch-22: for pentose sugars to emerge, you need a world that's already full of pentose sugars. The way out of this paradox, according to Arizona State researcher John Chaput, is to presuppose an earlier, less complex form of genetic material that could be a bridge between the lifeless prebiotic world and our current, DNA-dominated planet. The likeliest candidate, according to Chaput, is a molecule called threose nucleic acid, or TNA. Unlike ribose and deoxyribose, threose is a tetrose sugar, meaning it only has four carbon atoms in its molecular structure. From a chemical standpoint, four is a much easier number than five - threose could easily have formed from the combination of a pair of carbon fragments, each featuring two of the necessary atoms. That's all well and good, but the theory doesn't mean much if TNA can't actually function as a genetic material for simple organisms. The initial experiments on this point are encouraging, as Chaput reports that TNA "can fold into complex shapes that can bind to a desired target with high affinity and specificity." These functional TNA molecules were created from initial random sequences through a process of Darwinian evolution, the same process by which DNA and RNA first emerged as the carriers of genetic material in the real world. What's more, TNA is able to bond chemically with both DNA and RNA molecules and still function as a source of genetic information. That's crucial because, if TNA really did once provide genetic data for our planet's very earliest organisms, there must have eventually been a transition point from this early molecule to its immediate successor RNA. In this model, TNA serves as a simpler way for basic life to get started in the unforgiving primordial Earth, which was then able to give way to more complex macromolecules that were able to carry out a wider range of biological functions. Right now, there's no way to prove that Earth was once a world of TNA - indeed, biologists are still struggling to find hard evidence that RNA once served as the primary source of genetic material before the dominance of DNA. The way forward is to demonstrate that synthetic TNA really can provide all the functions required by early lifeforms. If that holds up, TNA could well then become the likeliest explanation for the first origins of life. Via Arizona State. Image by zentilia, via Shutterstock.